via media is video enhanced curricula designed to proclaim the Good News of God in Christ Jesus and to present the Episcopal Church in a contemporary context. via media celebrates who we are as American Anglicans and invites others to "come and see," offering seekers both the content and the context for conversations about Christian faith from an unabashedly Anglican perspective. via media invites those seeking spiritual community to explore Anglican Christianity through a non-threatening course of study, prayer and conversation surrounded by radical hospitality. We are excited about your interest in via media and warmly welcome you to a rewarding path of self-discovery. If you are visiting for the first time, start with more information about what is via media or watch an online video preview. 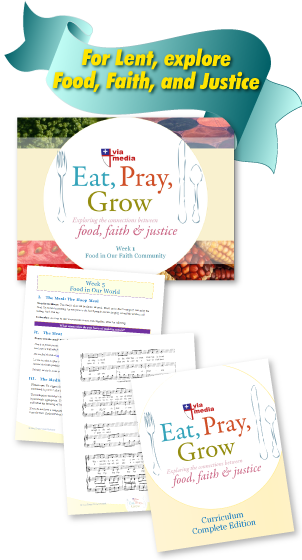 Eat, Pray, Grow is a 5-session curriculum that explores how we as people of faith use food and how we can be more faithful with food in an agro-industrial world.